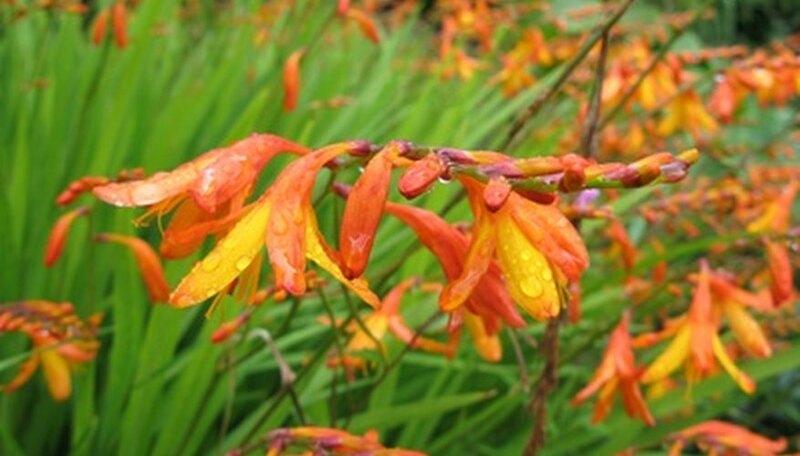 Crocosmia is a botanical genus of seven species of clump-forming perennials native to South Africa. Commonly called montbretia or crocosmia, these plants grow from an underground storage organ with a papery tunic called a corm. The spiky green leaves contrast the summer-occurring flower spikes of tubular red, scarlet, orange or yellow blossoms. The many varieties extant today derived from crosses among the wild species and are best grown in U.S. Department of Agriculture Hardiness Zones 6 through 9. Growing 30- to 36-inches tall, "Bressingham Blaze" displays long flower spikes with brilliant orange-red blossoms with yellow throats. It blooms in mid to late summer. Arching flower stems and spikes occur in midsummer on "Emberglow." Only growing 24- to 30-inches tall, its dark red flowers occur in two rows on the flower stems. Bright orange flowers with specks of maroon describes the late summer display on variety "Emily McKenzie," also called "Lady McKenzie." It matures at 24-inches tall. Also called "Citronella" or "George Davidson," "Golden Fleece" bears slightly arching and freely branching spikes of lemony yellow flowers in late summer. This selection grows to a maximum height of 24 to 30 inches. Late summer finds "Jackanapes" producing arching, many-branched flower spikes filled with bi-colored orange-red and yellow blossoms. This variety is also called "Fire King" and grows 16- to 24-inches tall, rather short in comparison to others. "Lady Hamilton" dons upright flower spikes filled with golden yellow blooms with centers blushed with apricot-yellow hues. It grows 24- to 30-inches tall. A steadfast performer in the perennial garden, "Lucifer" grows upwards of 3 to 4 feet tall in a robust clump. In midsummer, vivid scarlet red flowers appear on sparsely branched spikes. Unlike others, "Solfatare" foliage carries a greenish bronze tint to it. Growing 24- to 28-inches tall, it displays apricot-yellow flower spikes in midsummer. This variety is also spelled "Solfaterre." Late summer finds "Spitfire" producing flower spikes with uprightly held bright orange-red blossoms. The arching stems still allow this variety to reach heights of 28 to 36 inches. A very late flowering selection, "Star of the East" blooms late summer into early autumn. Growing 28-inches tall, its outward-facing blossoms are clear orange with a pale orange tint in each flower's center.